Veselin Topalov scored his second successive win over Vladimir Kramnik to take the lead for the first time in the match for the World Championship currently underway in the Russia republic of Kalmykia. After starting the match so well, Kramnik appears to be in freefall. For three consecutive games the Russian has been surprised on the opening, used copious time to find a counter to Topalov's new ideas and emerged with nothing but problems. In game 7 Kramnik hung on, but his resistance in game 8 and, especially, game 9 can only be described as pathetic. So how could the world's best defender have turned into a pushover? "I have no idea," said a surprisingly upbeat Kramnik after the game. "I hope it is just temporary." The signs are not promising. The last time Kramnik lost two consecutive games – just after the halfway mark at the Mtel tournament in Sofia in 2005 – Kramnik never recovered, losing to Topalov in the final round. Here, there will still be in the back of Kramnik's mind the thought that he effectively handed Topalov a free point by agreeing to play on after the forfeit in game 5 and that is now the point difference between the two. 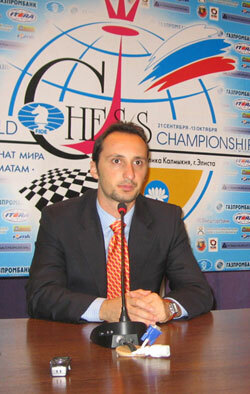 Unlike his manager Danailov, who seems to have been grinning since the match exploded into controversy after game 4, Topalov has only recently begun to look very pleased, as if he could see the finishing line in sight. "The initiative has been mine throughout the match - constantly gaining an opening advantage has been a big advantage. My strength usually increases at the end [of a tournament], and hope it will happen again in Elista." Until now both players had been moving quickly, Kramnik not unduly concerned that Topalov had substituted 8.a3 for the 8.Bd2 which the Bulgarian had used in a 2005 game. Now, however, Topalov goes in a new direction and Kramnik, as usual in the second half of the match, is the first player forced to begin thinking long and hard. "Invented by my second Vallejo - he specializes on this variation," expained Topalov. Without a ...Bb4 plan, taking control of ...e4, as an option, and ...g5 hard to achieve, Black is left with only ...c5 as a viable pawn break. Surrendering the centre with the text move makes finding counterplay with ...c5 even more imperative, yet over the next few moves Kramnik eschews logic and goes for a trickier, but far less effective, ...e5 break. 11...Nb6 12.Be2 c5 here (or next move) was playable but Kramnik is reluctant to give White's light squared bishop greater scope on the long diagonal and the chance passes Black by. Positionally suspect but "I couldn't find anything satisfactory," admitted Kramnik. "The game is virtually decided here, said Kramnik, perhaps only now realising how terribly wrong his plan had been, since an attempt to exchange dark squared bishops with 17...exd4 is well met by 18.Na4!. Perhaps not best, but even the more active 18...Qb5 cannot change the nature of the position, where White can build up slowly with Qc2 while Black can do nothing. Hardly desirable, but 19...exd4 20.Bxd4 leaves e5-e6 as a permanent worry for Black - plus two weak queenside pawns. 20.Bxf4 Qb7 21.Rad1 Rfe8 22.Bg5 Be7 23.Kh1 Nh7 24.Be3 Bg5 25.Bg1 Nhf8 26.h4! Be7 27.e5! Now that Black cannot put a knight on d5, this advance dooms Black to total passivity. A strange choice of square, but Topalov was following the recipe which had served him well so far in this and the previous game - healthy moves played quickly to put pressure on an opponent heading into time trouble. 33...Nd7 34.Qa2 Nb6 35.Rf3 Nf8? 38...Rxf7 loses to 39.Rxf7 Qxf7 40.Be6. Black is not only a pawn down but he can hardly move, e.g. 39...Kh8 40.Bg5! Nxg5 41.Rf8+ Rxf8 42.Rxf8+ Kh7 43.hxg5 with mate on h2 to follow.